John's Background Switcher is a desktop enhancement utility which changes the background image on your desktop every-so-often. The program doesn't just function as a basic wallpaper changer but also as one which can create custom backgrounds from multiple images by creating collages with different styles. 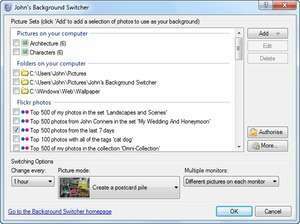 The settings of John's Background Switcher includes many customization options and can scan your computer for different images suitable for your desktop background. You may add folders or simply remove them. For security reasons, you should also check out the John's Background Switcher download at LO4D.com which includes virus and malware tests. Additional screenshots of this application download may be available, too. Johns Background Switcher download been highly rated by our users.